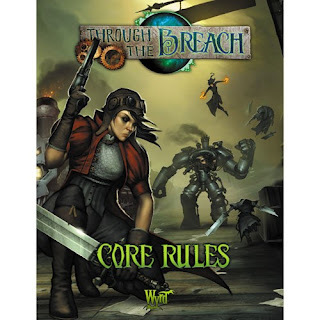 I’m working on a lengthier review of the book, but to start out with I’d like to share my top 10 history lore reveals from the “World of Malifaux” chapter of the Through the Breach Core Rules. It should go without saying but, if you want that sweet, sweet Malifaux lore to remain unspoiled, this would be the time to turn around and go back. See you next week for less spoilery content. 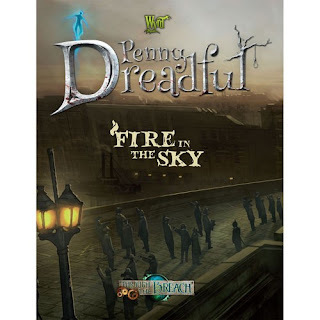 These were answers to a number of questions that have been in the background of Malifaux’s canon for quite a while now. I’m a lore nerd and this stuff makes me excited, so I thought I’d share. Titania is the very first undead creature in Malifaux. The energy she channeled to defeat the Tyrants killed her (probably explaining why she isn’t an unbeatable godling at this point, since she’s not alive anymore) and she arose as an undead creature after destroying the Tyrants’ physical forms. Her people locked her away after seeing what she could become inside of Nythera, a structure that echoed the Kythera gateway through which the Grave Spirit had nearly entered the world. The tyrant known as the Dragon was on Earth since shortly after Titania’s time. Her servants, realizing that the tyrants’ essences were still around despite their forms being broken, had started binding them away in prisons like the Red Cage or Plague’s prison in the Necropolis. Seeing this coming, the Dragon split itself in half and flung itself through the aether to Earth to escape. It landed on Mount Etna in Sicily, triggering a massive volcanic landslide and tsunami. He later took over a Cretan shaman to travel to Tibet and, realizing he would burn out the physical body of any but the strongest humans, he built a monastery there that would let him train replacements (eventually ending in the current iteration, Shenlong.) Meanwhile, the Dragon’s trip through the Aether weakened the barriers between the worlds, probably making it possible for the breach to be formed in the first place. Malifaux stuff has been on earth for a long time. Some Neverborn got into early North America and interbred with the natives, so Native Americans in this world are likely to have at least some amount of Neverborn blood in them. This, apparently, has some consequences when the Burning Man arrives later and awakens this latent heritage in them. The Amazon rainforest had a handful of Waldgeist wander into it in 220 AD. They thrived there and slowly wiped out most of the indigenous human tribes in the region, leading to rumors in Europe and east Asia that the deep forests are haunted with dangerous plant life. A valley in Mexico was the site of a portal, through which the Aztecs saw the blasted, burned ruins of a part of old Malifaux with still burning flames, leading to the creation of their god Huitzilopochtli in 1332 AD. The Horomatangi, a massive creature that served the Tyrant Meridion, was dumped near New Zealand and fed on the Maori for a while before being poisoned and sent into a deep sleep. And, of course, we know from The Other Side’s lore that the Abyssinians had their own breach into Malifaux for a short time and had discovered and reported on Soulstones long before the opening of the “first” Breach by the Council in 1780. The first of the Tyrants to escape its bindings happened a long time before humans came to Malifaux. Shez’uul was freed by a shaman of some kind, and promptly possessed him. This ended predictably (the shaman burned out) but he was able to sustain himself for a time by feeding on the blood of victims, ending in its becoming a creature of flowing blood. 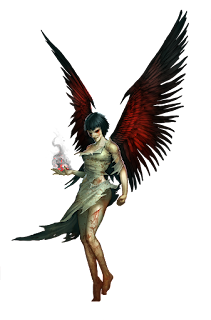 The Nephilim managed to beat him by turning their own blood into black ichor that would destroy red blood. Rather than let itself be bound again, Shez’uul hurled himself to Earth like the Dragon had previously done, landing in Kanagawa, Japan in 1293AD. It bound itself to a Samurai Lord and forced him to slaughter his subjects to supply him with blood. He was only then defeated when a sword was forged by Goro Nyudo Masamune, the Masamune Nihonto. The blade cut Shez’uul away from his host and bound him inside. That would have been the end of the story, but it was stolen decades later and proceeded to influence its wielders to greater feats of violence to feed itself. Eventually it passed into the hands of Kenshiro, the Weeping Blade, a hero of the first human entry into Malifaux. It played a key role in stopping December from escaping through the first Breach to earth (though it cost Kenshiro’s life to do so.) It was then thrown back through the breach and faded into the background of history before Zoraida directed Viktoria Chambers to recover it (not knowing about the Tyrant within, of course.) Though the Neverborn’s to kill her with a Doppleganger and claim the weapon failed spectacularly, Viktoria, her newly acquired “sister,” and the Masamune were able to foil December once again at Kythera. And they’ve been slingshotting across battlefields and murder your whole crew in one turn ever since. This has been discussed before, but we learn a lot about the Council of wizards who were in charge of the first expedition from Earth into Malifaux. Earth’s magic was dwindling, and so a group of sorcerors, wizards, warlocks, shamans, etc. formed a group to try and restore it, travelling to the new world and to Abyssinia to work on the problem. Eventually, they realized there was a world beyond ours (probably because of the East African people’s experiences, in large part) and combined their forces to punch a hole through to it. They gathered in Santa Fe, New Mexico for whatever reason and performed the ritual there, causing a massive explosion that killed many of them and supercharged the survivors. These newly empowered magic users travelled through the new Breach and were the first humans to enter Malifaux. They spread out, gained new Malifaux power, but became the ruling power for humans in the city. The time of the first humans in Malifaux came to an end due to December’s first attempt to escape. Some of the Archmages from the Council went into the Ten Peaks and, because they’re dumb, broke the bindings that were keeping him sealed away. It then took over the strongest of them, who then either subjugated or ate those archmages that remained. He then went to Malifaux city because he wanted to feed on the energy of the breach to complete his ascension to godhood, using a massive blizzard to conceal his arrival. Lilith and Nekima arrived to stop him, defeating his followers, but December would have succeeded if Kenshiro hadn’t arrived with the Masamune Nihonto to kill his host body. The day was saved, but the two Nephilim sisters determined that the humans had to go. In less than a decade, multiple Tyrants were already freed, and the witch Zoraida offered to seal the place up with magic. Zoraida sealed the portal while the Nephilim went through the city, butchering all the humans they found. At the last moment, Nekima hurled one final corpse back through the gate after scratching the word “Ours” into its chest. There are quite a few more details about the war that happened Earthside between the time of the two breaches. In a lot of ways, it’s like World War I broke out a century earlier than it did in our history, sparked of course by the sudden panic in the world when the flow of soulstones dried up. All the nations of the world signed a series of fragile treaties after the first breach closed, and a revolution in Eastern Europe triggered a series of these alliances to be triggered. This drew the nations into a war that would spread across the whole world. I very much enjoy the descriptions of how many of the nations fought in the war, including combinations of cavalry and musket lines along with magic, Spanish use of Necromancy, revolution in South America, and much more. There’s also a lot of information on the history of the Three Kingdoms (who, the book now explains, are Japan, China, and Vietnam. I always figured Korea was in there, but I was incorrect.) They stayed independent for most of the war but were eventually drawn in to attack Russia, Eastern Europe, and the Western US. When the dust settles, the world ends up underneath the Guild’s bootheels despite the war not really causing national borders to end up moving much. The Council imploded, fractionated, and ended up becoming the Guild because they could control the Soulstones everyone was fighting over in the first place. When Book 1 starts (in M1E) all four factions are in place and ready for action. However, the story of how the unsafe working conditions in the mines led to the M&SU’s rise is interesting as well, particularly since it really should have been the story of “the good guys.” After all, the original workers in Malifaux were convicts, so the Guild really didn’t care that much for what happened to them. When more independent workers started to come to handle the unexpected workload, these new men and women banded together more out of a need for mutual safety than anything else. The Guild didn’t realize the danger this posed until they ordered a group of miners underground during a torrential rainstorm, leading to their being trapped for days as the mines flooded. Of those that escaped their leader was not Victor Ramos, but a man named Erick Ulish. He then went on to rally the workers around the idea of standing together in mutual support to demand safer working conditions and better pay. They formed…not the M&SU, but the United Miners Union. Rather than rely on the Guild to do the work, they used the money from membership dues to hire engineers who did the work of improving the conditions, including Dr. Ramos whose Hollow Marsh Pumping Station prevented another flood from happening ever again. Given how important the engineers were to the cause, the union was expanded to incorporate them (which is how they became the M&SU.) But, after that, an “accident” leads to Ulish’s death and Ramos’ ascent to the leadership. After that, of course, the organized crime part of the M&SU grows up, the Arcanists arise from under their cover, and basically things go really wrong really fast from there. I also enjoyed the discussion of how this faction secretly came to power in the shadows of everything else. The Guild had been forced to close the whole city off after the Event, meaning the people in Malifaux City needed food, water and supplies and the people earthside needed the Soulstones that had been cut off. The Arcanists made a good living smuggling stones home, but the Katanaka crime family was able to grow up in the shadows of the ignored district of the city, the Little Kingdom, and solidify their power there by helping people the Guild had neglected. They became the Ten Thunders to disguise their origin, bringing their people through a secret, second Breach of which only they knew or were able to use. They grew quickly, infiltrating the factions of Malifaux and insinuating themselves in the city. Their power reached its zenith when they saved the city from “a Necromancer” (read: Nicodem) who was trying to take advantage of the chaos following Governor-General Kitchner’s failed ascension to power. He had killed off a large number of the other Necromancers in the city, adding their undead to his own, and attacked the Guild Enclave itself. Things looked doomed until the Thunders agents attacked in the flank, scattering the Resurrectionist forces and saving the city. The Ten Thunders have, however, contributed to the instability in the city as well. Lynch’s Honeypot casino is spreading dangerous drugs with nefarious purposes. They’ve brought the Tibetan religious leader Shenlong with them, not knowing that he is currently possessed by the Dragon who is all too happy to return to his home. After the Event was triggered by Hamelin, the released Aetheric energy from Cherufe’s red cage slamming into the ground gave a number of people the ability to ascend into avatar status. Some of these we know of, given that our masters were able to transform for several years prior to M2E’s release. The Governer-General, however, had the same ability, though he kept it hidden. He was hungry to push further and ascend to become a tyrant. He would have achieved this goal, but McCabe sabotaged the ascension ritual, substituting one of the relics with the bones of a Tyrant. When Governor-General Kitchner tried to draw on the relics’ power, these bones gave him too much power, and the ritual spiraled beyond his ability to control. Cherufe, sensing this, broke away from Sonnia Criid and combined with him, melding their two essences together to create the Burning Man. He travelled through space and time, arriving in Earth over San Francisco (there are more details about this event in the adventure “A Fire in the Sky.”) His arrival triggers the great 1906 earthquake, and leads to the creation of the fourth army in The Other Side, his Cult. He wakes the Horomatangi from its sleep. He triggers the Neverborn blood in the Native Americans to wake up, giving many of them shapeshifting abilities. And he weakens the barriers between the worlds, triggering the arrival of the Gibbering Horde in London. This chaos was the final straw for many of the nations of earth, who had already started pulling away from the Guild. While they have control of things in Malifaux, their authority earthside is waning significantly. India, Russia, the Ottoman Empire, Abyssinia, and of course the British Empire are now breaking away, with the Guild only able to serve as advisors and facilitators for the coming war Earthside. I don’t have a great way to end this post, so I hope you enjoyed some of these lore revelations as well. Next time, we’ll probably be talking about Collodi and tabletop crunch again.